And this year, this delightfully self-indulgent holiday falls on a Friday giving you a well deserved 3-day weekend! 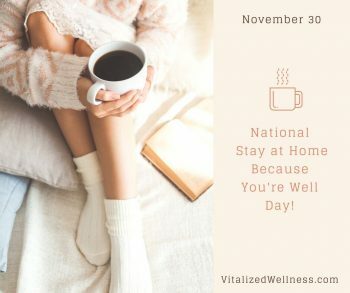 Take advantage of this before the hustle and bustle of the holiday season can take its toll. Wish it didn’t take me so many years to understand the importance of taking care of me first. I used to be a living, breathing example of holiday burnout. I’d say “yes” to every invite. I didn’t stop doing until everything on my list was done. I kept up with the parties and expectations around the season which left me feeling tired and drained. At some point, I stopped enjoying myself because I was tired and stressed. There were even some years that I missed out on a Christmas or New Year’s celebration because I let myself get too run down and would end the season sick. Finally, I realized that something had to change. But first, I had to learn how to listen to the parts of me that needed to slow down and rest. Eventually, I learned to turn down invitations and to be mindful of how many holiday “to-dos” I would commit to. It wasn’t easy. There was a lot of guilt and FOMO (fear of missing out). But, with the support of others, I learned to take care of me first. You see, you can’t give to others if you have nothing left to give. One of the tricks I learned was to manage my calendar in ways that put me first. You can learn this too! It’s really simple. And you can use these tips throughout the year to ensure that you get the downtime and rest you need. Here’s are a few examples you can use right now. At the end of each month (like right now! ), look to the month ahead and calendar all the events and commitments that are not flexible. Family events, holidays, other people’s events like weddings, and other celebrations, business commitments and deadlines. Now, look to the days immediately before and after these events or commitments. Make sure to schedule “you” time on those days around events. I know my threshold. Get to know yours. I’ve learned the hard way that I can’t go all day and night, both days a weekend without having downtime for me. Figure out how much downtime you need and schedule it before the weekend fills in with activities. Treat “you” time just like any other commitment and say “no” to other events and invitations. This is also how I manage my work week. Get to know your threshold here too. I don’t plan more than one or two evenings out during the work week. This way, I show up to work each day feeling rested. I am fully present to my clients and give them my best. For me, nothing zaps my productivity and sense of accomplishment more than being overtired. Not to mention how cranky it makes me. Figuring all this out and putting it into action didn’t happen overnight. And, many times I relied on support from others who had blazed this trail ahead of me. Which leads to my next tip – be cautious not to confuse productive support with complaining and commiserating with others who are also stressed and overwhelmed. They aren’t going to show you how to do it differently and you’ll only stay stuck in the pattern right along with them. Look for support from other women around you are who are good models of self-care. Talk with them and get to learn how they navigate all the parts of her life while still making time for themselves. These acts of self-care are essential for your health and well-being. But, they don’t come naturally and many women feel selfish or guilty when caring for themselves first. Our culture sets a woman up to feel bad when she takes care of herself first. If you don’t have women like this in your life, let’s talk. Supporting women with tools, tips, and strategies for guilt-free self-care is a huge part of what I do. In fact, its’ the foundation from which together, we create a vibrant, healthy lifestyle for you. Click here to set up a FREE call with me. 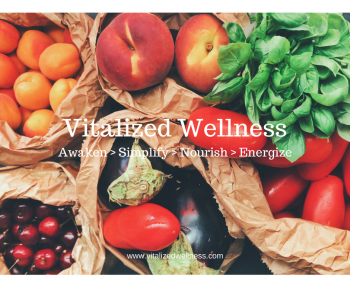 Live Your Vibrant, Healthy Life Today! Not everyone suffers from Seasonal Affective Disorder. But, if you do, its no joke and can take a real toll on your quality of life during the cold dark winter months. Symptoms can vary from person to person. You may feel a little more sluggish or fatigued than usual, your concentration or focus may fade quickly; you might find you need more sleep or are craving foods. Maybe it’s feeling less motivated than usual, or even being a little cranky or impatient with others. I used to feel all these and more. I’d be in my pajamas before dinner and seldom would go out in the evenings. No matter how early I went to bed, I didn’t want to get up the next morning. I was miserable from the end of October until the days became longer at the end of winter. It took me a while to understand what was happening and to learn that it didn’t have to be this way. And it doesn’t have to be this way for you either! 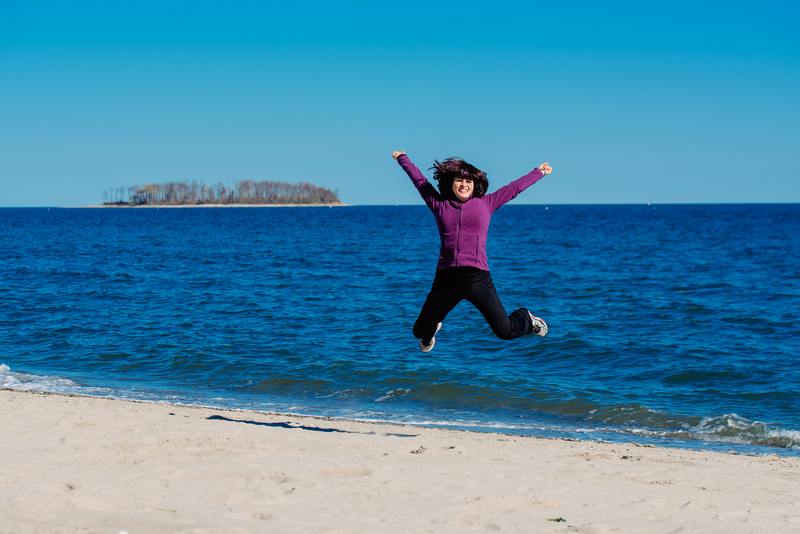 Here are three ways that I’ve found to beat the winter blues! Find any way possible to increase your exposure to natural light. 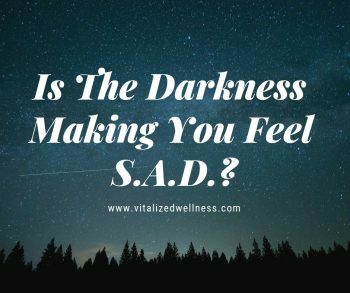 One of the triggers to Seasonal Affective Disorder is the decreased sunlight. So open up those shades and blinds during the day and go outside and get some sun on your face for 15-20 minutes each day. When it’s really cold out, park your car in direct sunlight and take in the rays from the comfort of your heated car. Schedule appointments or errands at midday so you are out and about in peak daylight hours. Do anything you can to be out in the sunshine and daylight. When that’s not possible, try a light therapy lamp or lightbox. These products mimic beneficial sunlight without the harmful UV rays. Key features to look for are units with broad spectrum lighting that is designed to treat S.A.D and the right size and shape to allow you to conveniently use it on a daily basis. Effective light therapy requires consistent daily use. Happylight by Verilux is the light that I use. Our bodies take the sun’s rays and convert them to Vitamin D. This time of year it’s impossible to get enough sun to produce adequate amounts of Vitamin D. it’s important to make up for this with a high-quality Vitamin D supplement. Low levels of Vitamin D can produce symptoms consistent with Seasonal Affective Disorder. Vitamin D supports the health of your immune system, brain, bones, teeth, lungs and heart. Low levels of Vitamin D can make you feel tired and fatigued and have been linked to depression. Here’s how I stay ahead of this. In the fall when we change the clocks back and put new batteries in the smoke detectors, I also increase my Vitamin D intake. 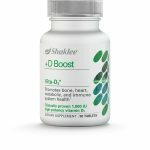 Here is the Vitamin D supplement that I take myself and recommend for you. B Vitamins are known as the “happy vitamins”. They support and nourish your brain and nervous system while helping you cope with stress, and can improve mood. They also help your body convert food to fuel while helping to manage blood sugar. B vitamins are used up very quickly by the body and can easily become depleted. And, your body doesn’t have the ability to store B Vitamins so you have to take in adequate amounts of B Vitamins each and every day. 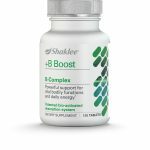 Here’s the B-Complex supplement that we take in my household. It’s a well-balanced supplement that contains all the B Vitamins your body needs. Exercise has been proven to lift mood and ease symptoms of mild depression and Seasonal Affective Disorder. And if you take that exercise out into the fresh air and sunshine the benefits multiply. Cross-country skiing or snowshoeing are great examples of fun outdoor activities and are a great source of aerobic exercise. If a moderate walk is more your speed then try a lunchtime walk. Lunchtime is peak time for the best sun this time of year. A 30-minute walk outside will help to increase blood flow, send lots of freshly oxygenated blood to your brain, release endorphins -the “happy” hormones, reduce stress, and will give you exposure to natural light. Also, remember that beneficial movement doesn’t have to be the form of exercise. Dance is a great way to get that endorphin rush while making it fun. If dance isn’t your thing, find something else you enjoy that gets you up and moving. I’d love to hear how these tips work for you. 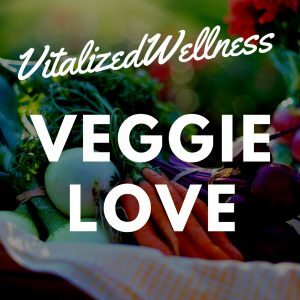 Drop me an email at Sharon@vitalizedwellness.com or leave a comment right here on this post. Wishing you a bright and sunny winter! 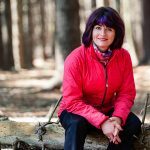 As a Certified Holistic Health Coach, I’ve taken more than twenty-five years of client work and personal life experience to create a proven system to help you live the vibrant healthy life you desire. If you struggle with weight, low energy or nagging health issues. I want you to know…It Doesn’t Have To Be This Way. I invite you to join me for a FREE one hour “It’s All About YOU!” call. Clarify your vision for a healthier, thinner, and happier you! Map out the next right steps for you to live the vibrant healthy life you so desire. Have weekly blogs delivered right to your inbox. There are so many varieties of fall veggies that you can easily find something to appeal to even the pickiest of eaters. You just can’t beat them for healthy sources of vitamins, minerals, essential fats and tons of fiber. I’ve broken them down for you in into three groups. I also give you plenty of healthy reasons to make each of these a regular part of your diet. Carrots, parsnips, radishes, potatoes, turnips, beets, and onions are just some of the nutritious root crops you’ll find at the market this time of year. Root crops are packed with vitamins, minerals, and antioxidants that boost immune function, reduce inflammation, and fight free radicals. You’ll also find them to have a hefty amount of fiber which keeps you fuller longer while supporting digestive health. And, lots of complex carbohydrates that act as fuel for your body without increasing your blood sugar as processed carbs do. Acorn, butternut, spaghetti, delicata, kobacha, and pumpkins are all in season now. These are some of the most well know squashes, but you may find more at your local farm stands and markets. Squashes are so good for you. They contain lots of vitamins, really important minerals and even good fats like omega-3 fatty acids. And like root crops, they also have a ton of fiber to support healthy digestive function and help keep cholesterol in check. 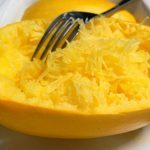 The vitamins and minerals in squashes help to keep your immune system strong, strengthen bones, and reduce inflammation. Spinach, chard, escarole, kale, and lettuces are all making a comeback with the colder temperatures. Local growers are still featuring these leafy gems as the growing season draws to a close. Greens are so important and should be a foundational part of your diet. Leafy greens give you many of the vitamins, minerals, and fiber that you find in other fall veggies, and a whole lot more. Leafy greens are an alkalizing food which means they make your body less acidic. High acidity levels promote inflammation. Inflammation has been linked to all of the common illnesses and ailments you want to avoid. Leafy greens also promote healthy digestion because they contain lots of enzymes that break down and digest foods properly. Here are a few simple recipes to help you get starting cooking with some of these great fall vegetables. There are so many benefits to raw food diets. But, there are some foods that can actually be more nutritious for us to eat in a cooked form. So how do you know if raw or cooked vegetables are better for you? The great thing about this time of year is finding the best selection of both raw or cooked vegetables at your local farmers market. Figuring out whether to go with raw or cooked vegetables can be easy if you understand a bit about nutrition. So here are some really simple points to consider when deciding. And I’ve included a tasty recipe which combines just the right ingredients to naturally enhance nutrient absorption. As a general rule, fruits and vegetables rich in vitamin C and B vitamins are best eaten raw. The reason why is two-fold. First, these nutrients are very delicate and break down quickly when exposed to heat. Steaming, boiling, roasting, or frying foods rich in Vitamin C and B vitamins will break down the nutrients and make them less beneficial. The simplest way around this is to eat fruits and vegetables rich in vitamin C and B vitamins in their raw form like in a salad. Or, cook them quickly by steaming or blanching. Some examples of these would be any of your leafy greens like lettuces, kale, or spinach along with red peppers and all berries. Secondly, foods high in vitamin C and B vitamins are best eaten raw because these nutrients are water soluble. So, guess where the vitamins go when they’re cooked in water? They dissolve right into the water. This is particularly true for boiled or poached vegetables. And even steamed vegetables will lose some nutrients in the steam. Here’s an extra tip for you if you’re going use a water-based method of cooking. Keep that liquid to use in your next soup or sauce to preserve those nutrients left after cooking. But be cautious not to overheat it or you may lose what you were aiming to keep. Cooking beta-carotene-rich vegetables make this pre-vitamin A compound more absorbable. Orange and red veggies like tomatoes, carrots, & sweet potatoes are most nutritious when they are cooked. In fact, one study found that absorption of beta-carotene was 6.5 times greater in stir-fried carrots than in raw carrots! Nutrients in these foods are also considered fat soluble. So for even greater nutrient absorption, eat your fat-soluble vitamins with a bit of fat. One vegetable that’s best eaten both raw and cooked – Spinach! Spinach contains so many beneficial compounds that its great eaten both raw and cooked. Eating raw spinach preserves the water-soluble vitamins C and B vitamins. Raw spinach can contain three times the amount of vitamin C as cooked spinach. Eating spinach cooked allows the pre-vitamin A, as well as some of the minerals like iron to be better absorbed. And it’s easier to eat a larger serving of cooked spinach because cooked spinach reduces in size, so you can consume more nutrition without feeling stuffed. As you can see by the spinach example, knowing if either raw or cooked vegetables are more nutritious can depend on the vegetable itself. Here’s a great spinach recipe for you that also incorporates the idea of combining nutrients to enhance absorption. Spinach is rich in the essential mineral iron. The lemon in this recipe is high in vitamin C. Vitamin C enhances the absorption of iron when consumed together. Enjoy! In a large cast iron pan heat olive oil. Add garlic and sauté for 1 minute. Add spinach, salt, pepper and toss with garlic and oil. Cover pan and cook on low for about 2 minutes. Sauté spinach for another minute, stirring frequently, until all the spinach is wilted. Remove from heat and squeeze fresh lemon juice on top. Serve & enjoy! Click Here to view the recipe as PDF or to print/save a copy of this recipe. It’s no secret that I am a farmers’ market fan. For one thing, you just can’t beat the convenience of having all those fresh fruits and veggies all in one place. But, I overdo it sometimes. I can get carried away and come home with enough food to feed us and the neighbors. This can create a challenge to keep those veggies fresher longer. As they say, necessity is the mother of invention. I certainly didn’t invent food storage. But, through my own necessity, I’ve come up with what I think are some really great strategies to keep those veggies fresher longer. And as a side beneift these strategies make healthy eating a breeze. The struggle to keep those veggies fresher longer is real. Some say it keeps them away from farmers markets. I get that. Tossing away spoiled produce is a real waste of money. 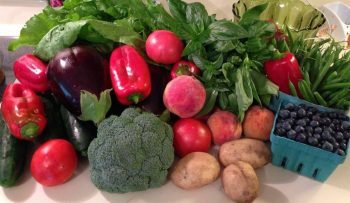 So, in this blog, I’m going to share with you some really quick and simple ways to keep those veggies fresher longer. For me, it’s all about getting it done quickly. Also, I try and keep in mind prepping ahead for the busy work week. No time to be cleaning and prepping veggies after work when we’re trying to get dinner on the table. It’s also a healthier habit to have everything cleaned and prepped ahead of time. Think about it. When you’re hungry and looking for something to eat, what do you go for first? The quickest most convenient thing you can get your hands on, right? Why not make sure that it is something healthy? This is why I carve out time either right when I get home from the market or first thing on Saturday morning. I clean, wash and prep everything I can before it goes into the fridge. First, you’ll need some supplies; a washing basin, white vinegar, salad spinner, paper towels, and the secret weapon, Debbie Meyer Green Bags. These bags are made with a natural mineral that helps to keep produce from spoiling. They are amazing and can keep produce fresh for up to two weeks. You can find them online or at local stores. Leafy greens like lettuces, kale, spinach, and chard get a white vinegar and cold water bath. These greens tend to grow in sandy soil and you’ll need to cut the ends off and submerge them in a basin full of water to get the sand out of them. Rinse until the water is clean and run them through the salad spinner. Separate into meal size servings and wrap in a clean paper towel. This allows you to grab only what you need for one meal when you’re short on time. You can store the separately wrapped servings all together in the same bag and keep them in the fridge. Berries can spoil quickly. Remove them immediately from the container or bag you bought them in. Wash them in a cold water vinegar bath and rinse well. Make sure they are completely dry before you store them to prevent mold. Bigger berries like strawberries you can lay out on baking racks. Smaller berries like blueberries spread out on a paper towel until they are dry. There are conflicting opinions on storing berries in the fridge. Some say yes, some say no. I keep some in the fridge and some in a bowl on the counter based on how long it will be before we use them. But here’s the thing, in our house the ones that are out on the counter go a lot quicker and are less likely to be forgotten about. Berries are a healthy grab-n-go snack and are a much better choice than chips or junk food so make them readily available. Vegetables like peppers, tomatoes, cucumbers, zucchini, and potatoes get cleaned right away too. Another cold water bath with vinegar, dry thoroughly, and into a green bag before storing in the fridge. Keep the onions and potatoes out of the fridge. They should be stored in a cool, dark, dry place, but not together. Onions and potatoes each give off gasses that cause the other to spoil faster. You’ll want to do the same with fruits like peaches, plums, nectarines, apples, and pears. Wash in a cold water and vinegar bath, rinse with clean water, dry completely, and store. Often I will leave these fruits out in a fruit bowl for a quick grab-n-go snack. But, if you’re family doesn’t eat them quickly like we do, store in a green bag and keep in the fridge. But remember, just like the berries, if you keep these fruits visible and ready to go, they’ll be the snack of choice instead of candy or chips. As you can see this post is about more than simply keeping those veggies fresher longer. 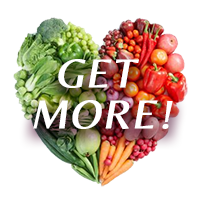 It’s really about making it easy and convenient for you and your family to have healthy food choices at the ready. The more healthy habits like this you can adopt, the easier it is to maintain good health. Here’s a cool and healthy summer recipe that uses some of your farmers market goodies. In a blender, combine lemon juice and spinach. Pulse to combine. Add cucumber and puree until smooth. Scoop avocado into the blender and continue to puree until mixture is very smooth. Season with salt to taste. Chill. Serve with dill, radish, and parsley as a garnish.